While you could fairly say that building pocket trumpets and cornets is an exercise in creating the least instrument with the most effort, I treat these projects seriously. I would never want to put together such an instrument that was not as good acoustically or esthetically as the full length version. While sometimes harder to hold with the left hand while playing, I have found my finished projects equal or superior to the mass produced, full size versions. This is the result of careful design and workmanship. While the design of each of these is changed slightly in the process of "pocketizing", I put a lot of effort into retaining as much of the original acoustical design as possible. In most cases, the mouthpipe must be changed, such as this one which is longer. I use a taper that is very close in dimensions, including the mouthpiece gap (although original Martin Committee trumpets vary to a surprising degree in this). I even considered making the lower tuning slide tubes reversed, but it really wouldn't have made the design closer to original than the final design. This tapers where the cylindrical upper slide tube would have been and is cylindrical where the tapered crook was (more like the proportions of a Schilke trumpet). 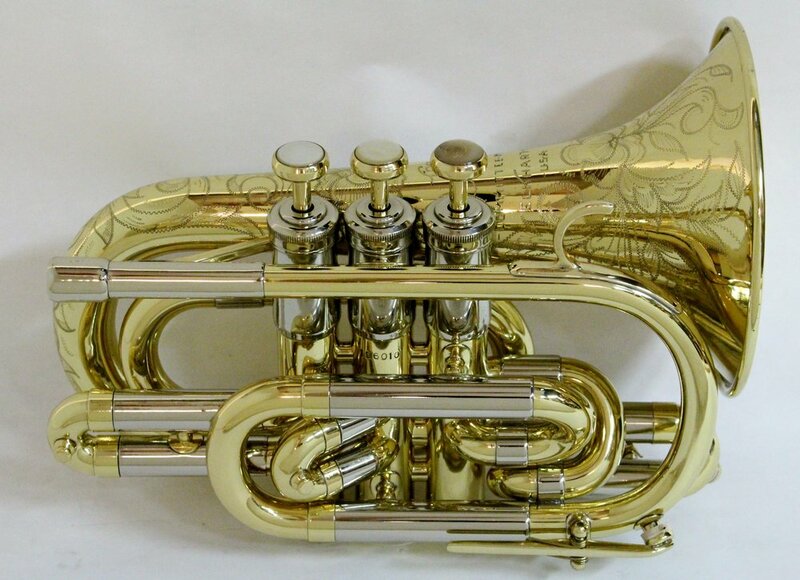 I also had a Committee model cornet parts horn, from which I used the entire tuning slide assembly and return crook which attaches it to the third valve knuckle. On the bell side is a similar situation, where the length that would have been the bell tail is taken up by the crook leading from the first valve to the bell branch. The original length would have been slightly tapered, from about .453" to .462". I used a crook with a bore of .460", stretched out one end and shrunk the other, approximating the original tube dimensions. I don't have a strong opinion on how important this is, but it was easy to accomplish and works well. You might wonder why I why I would destroy a fairly valuable 1956 Martin Committee Deluxe trumpet for the sake of this project, so I include the fourth photo on the left, showing the donor trumpet. As with the Bach pocket cornet project, this was a wreck of a parts horn that really wasn't worth restoring. First, I sent the valve section off to Anderson Silver Plating to get the valves refit. Meanwhile, I bent the bell to the proportions that I planned and then sent it off to Sherry Huntley of Artistic Engraving to have extra deluxe engraving that she specializes in. The rest of the details were designed around how the bell fit the valve section. It was important to me to include original details such as the finger hook and diagonal brace, which had to be attached to the baluster brace in order to make it fit. I arranged the extra curves in the third slide so that the original water key could be used conveniently. The length of this trumpet, without mouthpiece is 8 5/8", the bell diameter (unchanged) is 4 3/4" and the bore measures .453". The fifth photo on the left shows the original parts that weren't used. I had an extra third slide, so I didn't need to cut that up. The last photo, below, shows this trumpet between the Bach cornet and a Benge pocket trumpet built in 1974 at the Anaheim factory.